'92 964 C2 Series II Coupe. 5 Speed. 29k. Original Paint. 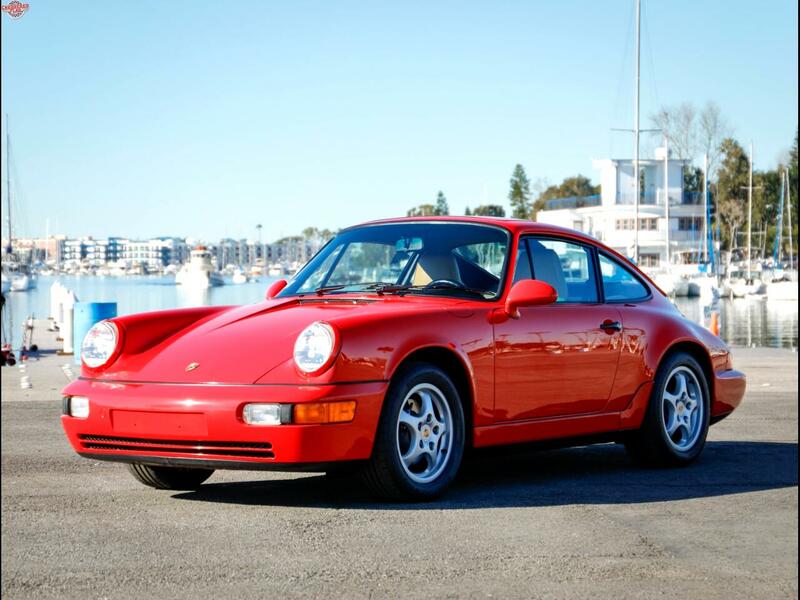 Chequered Flag International is pleased to offer this 1992 Porsche 964 C2 Series 2 Coupe in Guards Red with Tan leather. 29,500 miles with clean Carfax. Manufactured from the Special Wishes Program with Special Chassis - see CoA below. Perfect body with perfect original paint. All stickers in place including option code sticker under the hood. Fantastic interior, soft un-redyed seats with very minor wear on drivers bolster, perfect dash. Carpets, door panels and roof liner are also perfect. Mechanically superb with no issues, no smoke on start up, great power. Smooth shift with good syncros. Great clutch, brakes and steering. Windows, seats, sunroof and A/C all work superbly. Last owner was a fastidious collector who took it to a good independent Porsche repair facility and spent over $12K Making an already superb car unreasonably fresh - see receipts below. I can't overstate how good this car is. 964 C2 is the 911 to buy, series 2 is a big step up and very limited production numbers for a coupe - in the hundreds when you subtract the 740 odd RS America's. Plus super low miles and original paint make it eminently collectible. Seriously the best one I've ever seen. Comes with its books, including maintenance book with option sticker stamped with six services, tools, jack, air pump, all original keys, key card and Certificate of Authenticity. Inspections encouraged. All sales AS-IS. Sales tax and license fees due if delivered in California.